I’m not gloating, exactly. I’m simply pointing out that, after Sarah got two speeding tickets in two days, I took back the wheel today, drove almost 450 miles through Oregon and northern California, and arrived safely at the motel du jour with nary a dirty look from the authorities. I even drove through a tree, but I’ll get to that later. I haven’t read the laws of physics in a while but I’m pretty sure they say that our dune buggy should have tipped over at several points throughout the ride. Sam said the ride was the most fun thing we’ve done on the entire trip. I think he’s right. If you have never ridden across massive sand dunes at 30 mph, make sure you jump at the chance when you get it. The brief video I took doesn’t really do the ride justice, but I’ll share it anyway. The dunes marked an exciting milestone in our trip, too: about halfway through the ride, Dustin stopped the buggy on the beach and we all got out for a minute or two. Sam and I went right for the water. It was freezing cold, but touching the Pacific Ocean meant we had officially gone from coast to coast, from sea to shining sea. 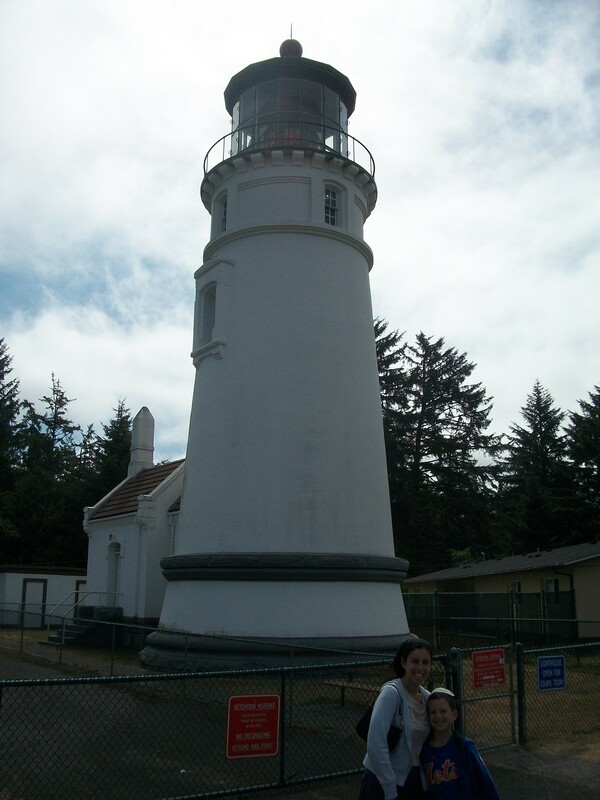 In a day full of superlatives, we left the biggest sand dunes and headed to the oldest lighthouse: the Umpqua River Lighthouse, which was the first one in Oregon–sort of. See, the original one collapsed into the sea after sand eroded the land it was built on but after several years it was rebuilt in a slightly different spot and … well, it’s not the most exciting story and the guided tour went on way too long, but the lighthouse was still pretty and, unlike the ones we visited Tuesday, we got to go inside, all the way up inside the giant prisms at the very top. Our final stop on the Oregon Coast called itself a wild safari. Unfortunately it was more of an abnormally well-stocked petting zoo. 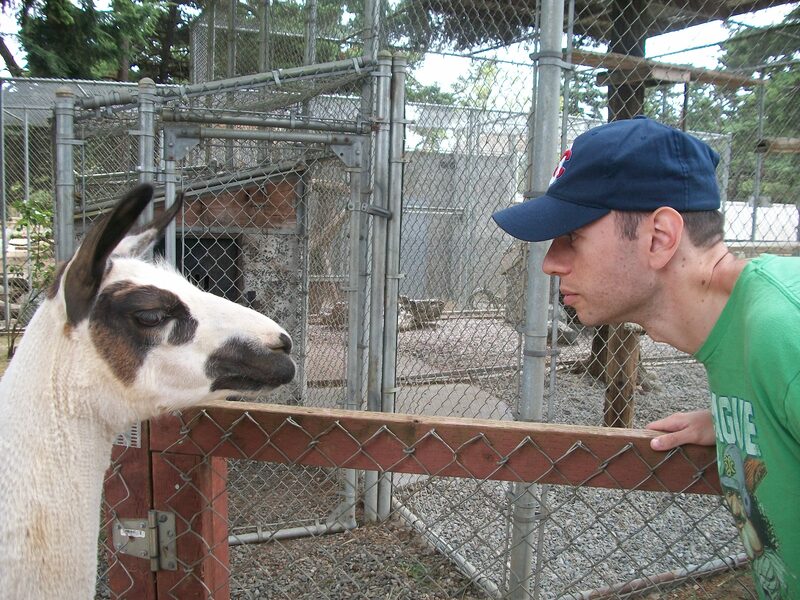 But Sam had a great time with the animals and I won a staring contest with a llama, so we counted it as a win. 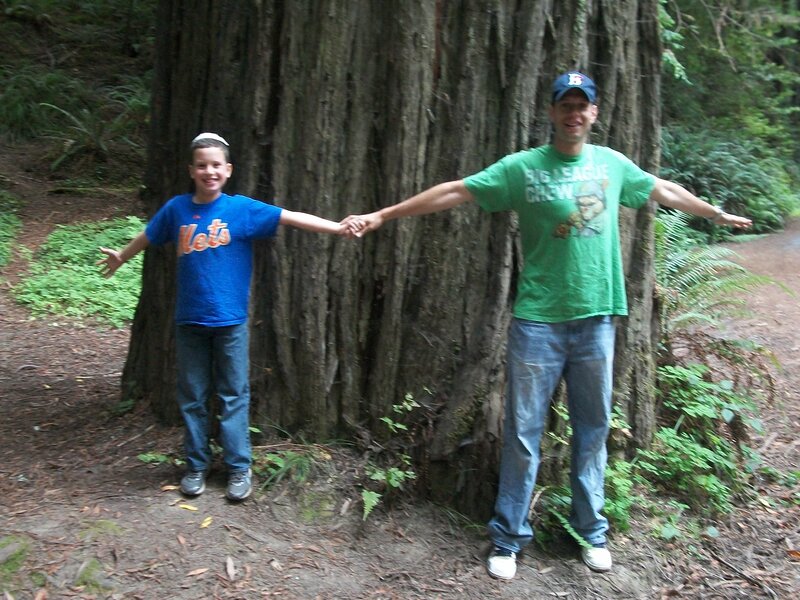 After seeing the biggest, the oldest, and the smelliest, we entered California in search of the tallest: the giant redwoods. They weren’t hard to find. 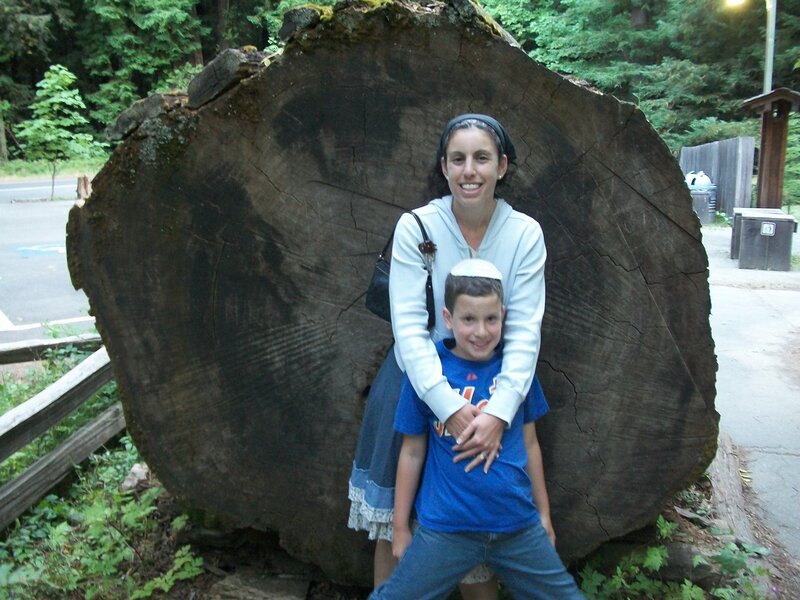 Our main destination was Avenue of the Giants, a windy strech of road that runs sort of parallelish to Highway 101 for 30 miles through a forest of some of the oldest and tallest trees on Earth. It was absolutely breathtaking. And I say that after spending almost all of last week in National Parks. Sam and I had fun pointing out the big ones to each other. Needless to say we did a lot of pointing. As Sam said, “They’re all huge! And the ones that aren’t huge, are even more huge!” We also had fun posing in front of some of the “even more huge” ones. 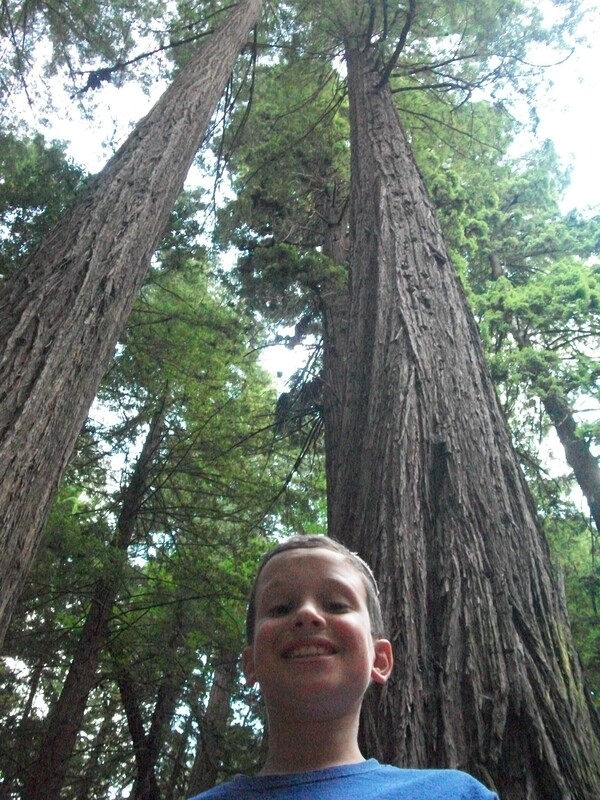 Months ago, when I first told Sam about the redwoods, I told him there were some that were so big you could drive through them. Since then, every time California has been mentioned he talked about driving through a tree. As impressive as the forest was, I knew we had to drive through a tree or he’d consider it a disappointment. But after two days of pretty bad luck, nothing was going to derail our fun today. 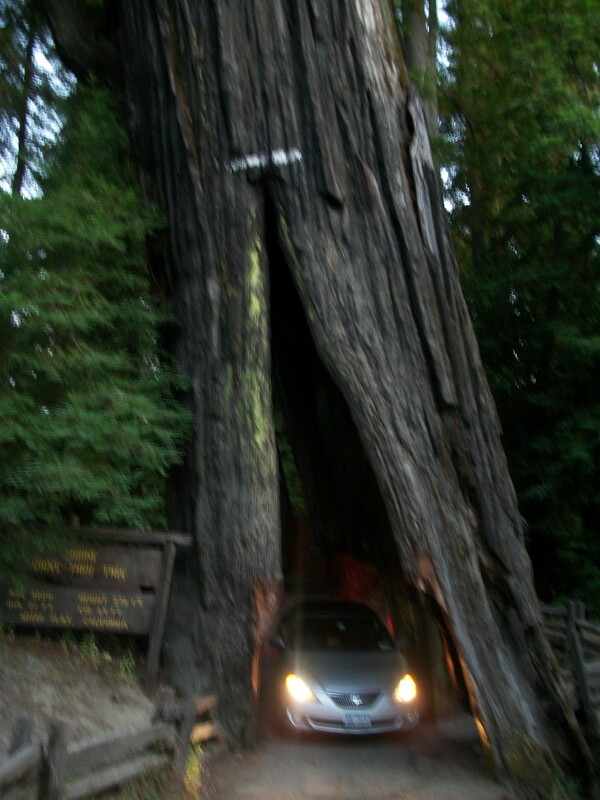 We came, we saw, we drove through a tree. 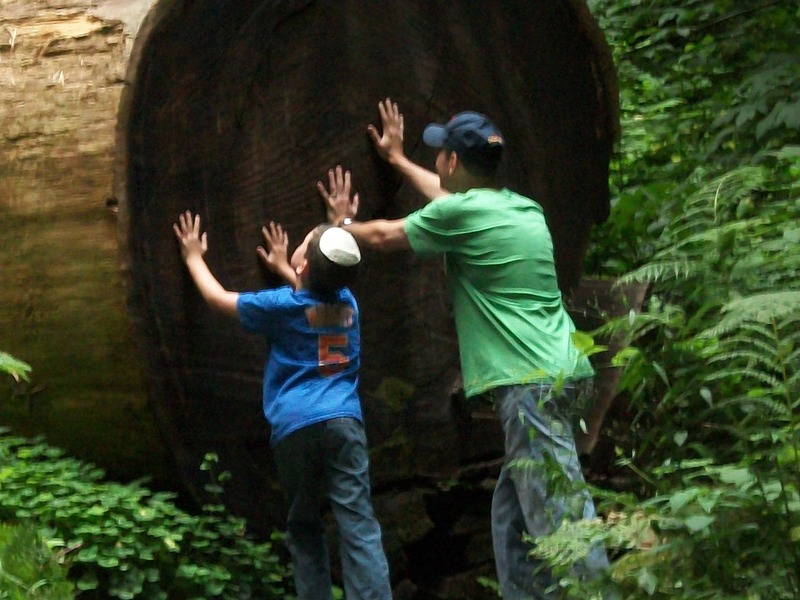 Incredibly, redwoods weren’t the only interesting sight as we wound our way through the forest. 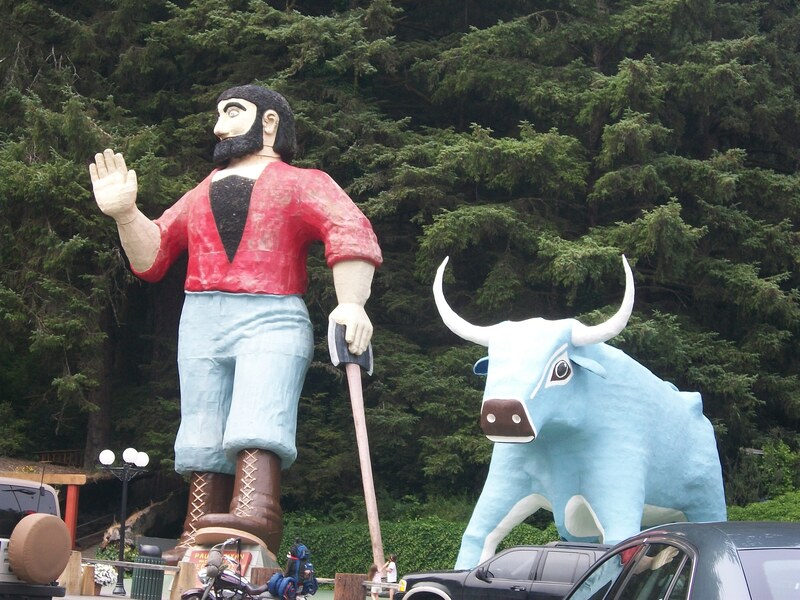 We passed two herds of grazing elk, and we got to add a life-sized Paul Bunyan and Babe to our collection of odd roadside statues. It was a long day with a little too much driving–even half of our destinations revolved around driving–but it was fun start to finish. Which is especially good because Sarah flies back home Thursday and after all the trouble she had here she gets to leave on a positive note. It’s amazing how much fun you can pack into a single day when you don’t get delayed by, say, the police. Not that I’m gloating. You’d really better hope you dont get any tickets on the rest of the trip… you will NEVER hear the end of it after all this “not gloating”.